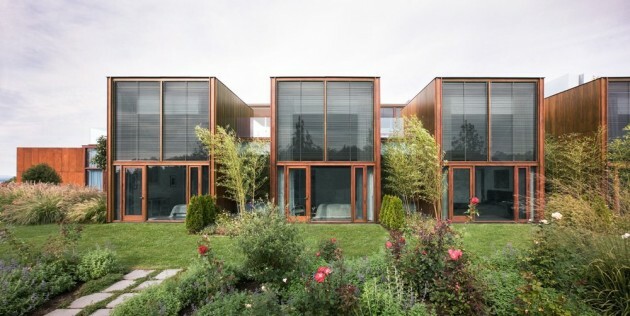 Thomas Phifer and Partners designed this house in Millbrook, New York. The journey of arrival at the Millbrook House is an unhurried ascent, focused on experiencing and re-experiencing the land. 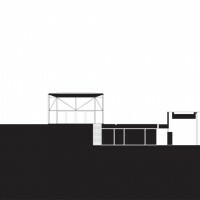 On this 200-acre site, an architecture of discrete geometric objects set within a heroic landscape choreographs the route, mediating an unfolding sequence of thresholds and views. Up a rambling drive, through a forest to a small, gravel car park, the approach shifts to a footpath, rising along a hill’s ridge. In spirit, the progression recalls the seemingly meandering, yet deftly orchestrated path to an Ancient Greek temple, engaging the visitor with a landscape held even more sacred than the building itself. 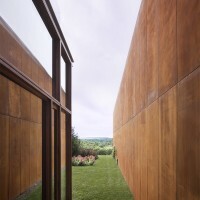 At Millbrook, the first glimpse of built form is a cantilevered, weathering-steel box, the guesthouse, hovering over an edge of the car park. 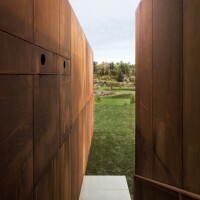 Deep red, patinated steel panels form a retaining wall, extending from beneath the studio straight up hill, rising with the regular rhythm of metal plates beside bluestone treads, set into the slope like stepping stones on a pool of water. 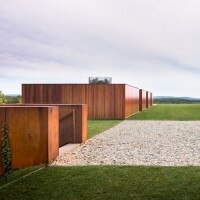 The ascent reaches the hill’s crest, a grassy promontory, flanked by a rectangular glass pavilion along one side and, on the opposite edge, a series of four low, mahogany-sheathed volumes—as pure and distilled in their geometric repetition as a Minimalist sculpture. 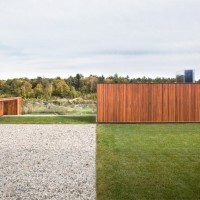 This arrangement around the clearing frames long, perspectival views of the Hudson Valley, reminiscent of the vista-capturing gestures of Thomas Jefferson’s University of Virginia and Louis Kahn’s Salk Institute. 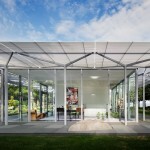 The glass pavilion at Millbrook sits so lightly and with such transparency that its floor seems to flow uninterrupted from the surrounding carpet of lawn. Once you’ve crossed the threshold, into the living-dining-kitchen space, full panoramic views open up, dramatically and in all directions. 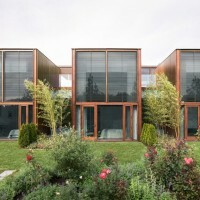 This clear volume plays against the wood-clad monoliths, windowless from the approach, their opaque, mahogany shells echoing the rich, earthy hues of the weathered steel. 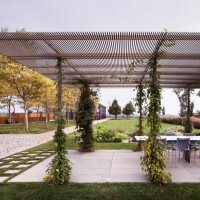 Though seemingly freestanding, the pavilion and its wood counterparts all connect indoors, beneath the grassy precinct. 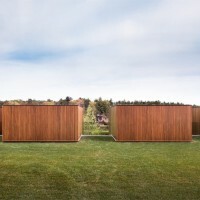 Each mahogany box, partially embedded in the sloping terrain, forms a private cabin for sleeping and bathing, entered one level below the glass pavilion. 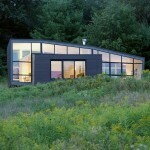 As if emerging from the earth, these high-ceilinged cabins have an intimate rapport with the landscape. In counterpoint to the visually expansive hilltop perch, they open only eastward, to the morning sun, each to its own bamboo garden and the meadows beyond. 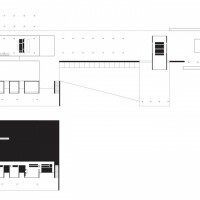 Your perception of the house and site evolve: not simply as you cross the land, but also as you move through the interior, from grand communal to quieter private zones. 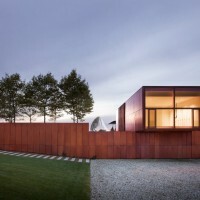 Outside, the experience crescendos as you crest the hill and step across the high lawn. 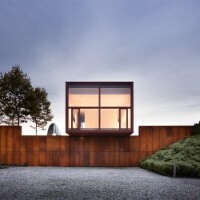 But only when you venture into the glass pavilion does the journey reach its climax, from contained space opening to the vastness of the landscape. 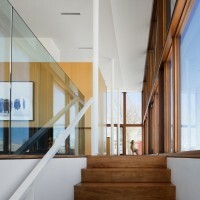 Visit the Thomas Phifer and Partners website – here.